One of the things that i have learned over the years is the crazy amount of variables in Surfboards, From the shape right thru to the construction methods and materials. I see old school shapers who have perfected the art of making a particular board they like again and again without using a machine.. true artisans. However each board they make still has so many variables beyond control of the maker, we find that each board still surfs differently. What are these variables that are not shape dependant? 1- The PU (polyurethane ) foam we normally use to make boards is hand mixed, each and every blank. Putting the blanks formulation completely open to the human mixing it, the weather and the current batch of chemicals he has on hand. Who Poured your last batch of Foam? 2- The Stringer, thats right that little strip of wood down the middle started as an organic tree, the spring or flex in your stringer is open or controlled by what kind of wood it is, the location and conditions the tree grew in, the cut of the timber it was taken from… etc etc. 3- The day/conditions your board was glassed in. Yes the polyester resin commonly used making everyday surfboards is open to a large range of variables. the temperature controls the amount of catalyst we use along with the skill set of the human laminators squeegee techniques and current mindset. 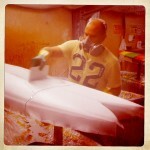 Martin Wright laminates a twin fin fish in the Diverse glassing room. doing it old school with PU resin and a squeegee! These are the basic common issues we have trying to duplicate magic boards. These issues are nothing to do with the shape of the board. Next Next post: How is the Foam Blank made for Dynocore™ boards?